It's in the near of the metro station , and there is a big mall in the near. the Internet was really fast. Clean, good value for price. Fully equiped, even with a washing machine. 1,5 km from Sagrada Familia. The hotel is very well located, not far from the center. 10 minutes by walk to the Arc de Triomphe. Nearby there are a metro station, a large shopping center with a huge Carrefour, a few small bars and restaurants with breakfasts. The room was clean and well furnished. Loved that it was round the corner from the design museum, the metro station, and not far from Sagrada Familia. Washing machine very handy. Lovely balcony to top floor apartment. Lift to all floors. Lovely and clean. Pleasant team. I liked the peace of this place, you always have the opportunity for being quiet. It was close to metro station, but there was a lot of police what gaves the impression that its not safe. One of our best sellers in Barcelona! These stylish apartments close to the Torre Agbar and Glòries Metro station have free Wi-Fi and fully equipped kitchens. The Barcelona City Apartments offer flexible accommodations for up to 4 people. They have TV and DVD player, and the kitchens have microwave, fridge, hob and washing machine. The apartments also have an iron, towels, and bed linen. Barcelona City Apartment can be found close to Plaça de les Glòries, a transport hub in Barcelona. You have easy access to several Metro, bus and tram routes. You are only 10 minutes’ walk from the beach. 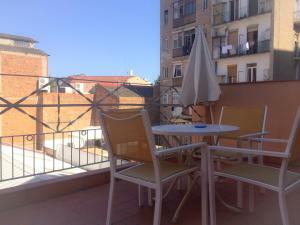 When would you like to stay at Barcelona City Apartment? Has a lounge area with a dining table and a kitchen. House Rules Barcelona City Apartment takes special requests – add in the next step! Barcelona City Apartment accepts these cards and reserves the right to temporarily hold an amount prior to arrival. Guests who plan to arrive after 6 pm are requested to pick up keys at the main office of Barcelona City Apartment. Contact the establishment for more information. There are no additional charges. Please inform Barcelona City Apartment of your expected arrival time in advance. You can use the Special Requests box when booking, or contact the property directly using the contact details in your confirmation. Photos shown are not a good representation of the place.. it was very basic.. uncomfortable cheap unstable bed .. would not book this place again.... nowhere to sit down relax, just cheap quality everything... except for the cooker hob top..!! The humidity in the room is too high and no way to have some fresh air as there is no window in the room. Also it was very uncomfortable (we are 2 girls and had huge and heavy luggage) to pick up the keys in the central office even considering the fact that we arrived at 18:15 and called around 17.30 asking to wait for us and ready to pay some extra money for this. Also be ready to show your credit card you used to book the room when picking up the keys. If you don't have it, it could be a problem. The reception is unavailable most of the time. The electric cooktop is an induction type but there was only one pan compatible and no sign to know this. Noisy air heater and no central heating. There was only one minus - the noise in the mornings from a nearby auto repair. They started work at 7am. Make sure you know that the hotel for out of hours key pickup is half an hour walk from the apartment! Make sure you check Booking.com site that you have stated 2 people staying in the apartment.... Just booking a room for 2 doesn't cover the cost for 2 people. Had to pay €125 more for 5 nights locally. After 6 p.m. you must pick up the keys in a Barcelona City hotel which is more than half an hour by walk from Barcelona City apartments. The windows are to a very little courtyard. Good location. Nice bathroom, kitched equiped.